24-Jun-2007 -- I had bad luck in Cyprus with confluences. 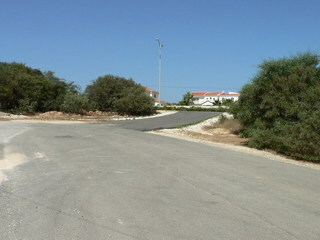 First point in Cyprus was N35 E34. I had sent this point to the GPS from my PC before the journey, in Hungary. It seemed a very-very easy found. The point is near to the road, no problem. We started our trip in Ayia Napa (Agía Nápa) with a rented car. We wanted to go to Larnaca but first I needed to find the confluence. In 10 minutes we caught the crossing. Our heading was to North and because the road was wide with median strip we had to go to the roundabout and go back. I was very surprised (and was very hot), I took a photo of the GPS only. :-((( I marked a new point with the bad Map Datum and continued the finding. We had to travel back to the town, go in to several streets. At the end I found the (wrong) point). In my home I had read all of narratives about this point but on the site I thought the area had been built-up. I took a lot of photos of the (WRONG :-((( ) area. Some of them was taken to the right direction: to the right point. But it was about 100 meter from the confluence.